Hurricane Dean was approaching Jamaica as a strong category 4 hurricane when it took a last minute jog to the west which spared the island from almost certain disaster. Even without making a direct hit, Dean brought hurricane conditions to most parts of Jamaica with heavy rain, high winds and huge waves & storm surge. I flew in the day before the storm hit and intercepted to storm along one of the coastal highways where we thought the best combination of winds and daylight would be. Joining me on this chase was veteran hurricane chaser Jim Leonard. 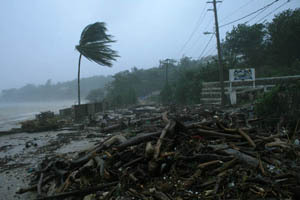 At one point, the rising storm surge brought a huge pile of debris crashing onto the road right where we were standing. 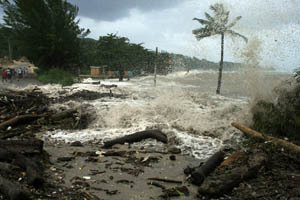 We had to scramble out of the way as huge logs, rocks, coconuts and other debris washed all around us. Roads became blocked and fuel was low so getting to other parts of the island were impossible. Luckily only three fatalities were reported. 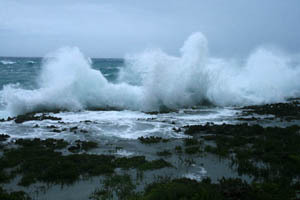 Huge waves from hurricane Dean crashing onto the Jamaica coastline. Storm surge plows onto the coastal road carrying all kinds of large debris, including rocks, logs and other trash. 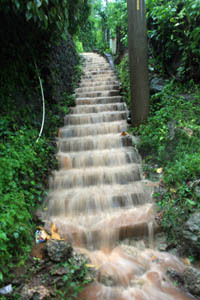 Heavy rains turned this stairwell into a raging waterfall. 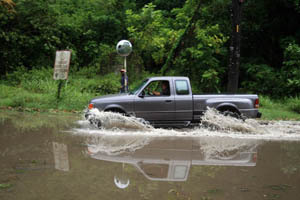 Road flooding was also quite extensive around the island. 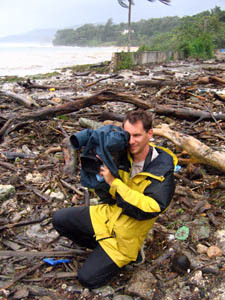 With camera in hand as I walk through the debris left behind by the surging seas.